"Sam is absolutely, hands down, the best trainer in Park City, if not Utah!" "...because of her thoroughness and extreme knowledge base, Sam has been able to customize a safe and effective program that allows me to exercise without pain." "I am always impressed with her vast knowledge and the ability to make each workout unique." "Sam is excellent at developing strength while being aware of my body and the alignment." "Sam is motivating and supportive. She truly wants you to achieve your fitness goals and her efforts are constantly moving you in the right direction." Click here to access more testimonials & endorsements. As a Certified Personal Trainer and Corrective Exercise Specialist, Sam is committed to helping her clients improve their fitness and health. Sam received her credentials as both a Certified Personal Trainer and Corrective Exercise Specialist through the National Academy of Sports Medicine and has received additional certifications in Indoor Cycling, Yoga, Mat Pilates and Postural Alignment Therapy. Sam is also a member of the IDEA Health & Fitness Association. Sam continuously augments her fitness and health education because it allows her to provide her clients with the best experience in both a safe and challenging environment. Sam has worked with an incredibly wide variety of clients, including youth, teenagers, older adults, pre- and post-natal women, mothers looking to “reclaim” their fitness, post-rehabilitation clients, clients with chronic pain, individuals with special needs and athletes. Sam excels in her ability to evaluate each client individually, then create an optimal progressive training program which takes advantage of proven exercise science and her vast expertise. Sam’s functional training incorporates the use of body weight, stability balls, Bosu balance trainers, medicine balls and other tools to create multi-muscle, multi-joint demand with the goal of developing a balanced & strong body to allow you to live pain free and meet the specific demands of your sports, activities and life. A strong and functional body directly leads to improved sports performance and a higher quality of life. 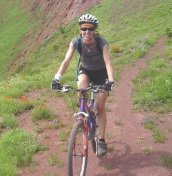 As a lover of everything outdoors, including mountain biking, skate skiing and alpine skiing, Sam loves to see her clients become even more active and adventurous as their fitness improves. Sam's personal goals when working with her clients are to provide them with the individualized support and tools to achieve and even surpass their personal fitness and health goals while making the journey as fun and enjoyable as possible. An Initial Fitness Assessment provides the starting point for your customized training program. Additional services include Consultations, complete Corrective Exercise Plans and Personalized Take-Home Training Plans.